Southern Ca Weddings Start HERE! FREE Bride-To-Be Sash with BLACK SWAG BAG, MAGAZINES, GIFT CARDS, PURCHASE Tickets Now. Register Now below. More fashions, more new ideas and more choices than you can imagine. With spectacular runway fashion shows and displays from the area's most trusted wedding professionals, you will find everything to make your wedding day extraordinary. Come and enjoy samples of cake & gourmet foods. Inviting all San Diego, OC & Inland Empire COUPLES!!! Brides can register to win thousands of dollars in gifts and prizes, including a honeymoon cruise. As for you future GROOMS, you'll find plenty of flat screens inside our GROOMS CORNER to catch the NFL Game. Come and support your future bride. LEARN MORE ABOUT THIS BY REGISTERING TO ATTEND. FIRST 100 BRIDES IN LINE WILL RECEIVE A Blinged Out Bride-To-Be Sash with a BLACK SWAG BAG. Receive a FREE Copy of the Wedding Bible by Here Comes the Guide valued at $100.00 in book stores. Spa packages will also be added through Elive Live life. Learn more. Whether you are just starting your planning, finishing up the last details, or anywhere in between, you will find exactly what you are looking for at the Kiss the Bride Show. Be SURE TO ARRIVE EARLY!!!!!!!!! 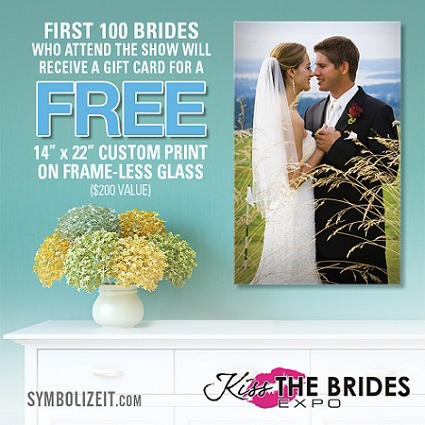 CLICK HERE to purchase tickets for the Kiss The Bride Show on August 25th 2019. Buy your tickets online and save $2. Tickets will be $12 at the door. Problems? Email or call (626) 356-9036. Complete the form below and we will email you a $2.00 Discount Coupon for the ticket purchases at the door.